Headway Strategies Consulting offers several assessment tools that can be applied at the organizational and individual levels. Contact us to discuss the best approach for the issues that you want to address. In today’s business environment with all of the radical changes, uncertainty, new rules and regulations, and increased customer demands, how do you manage and thrive as an organization? We have found that a significant variable is how well your organization is cross-functionally aligned to the organization’s vision and goals. 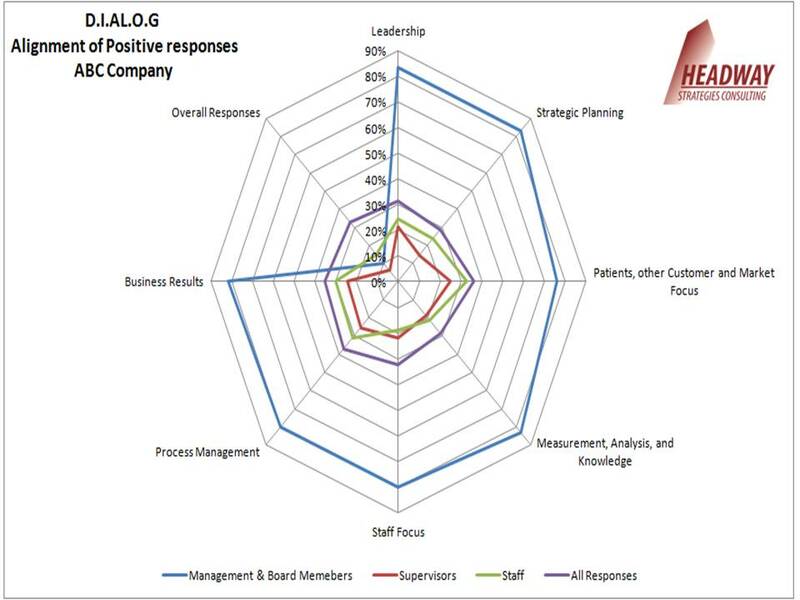 The D.I.AL.O.G Assessment (Data Indicating Alignment of Organizational Goals) is an organizational assessment tool that provides information as to how well critical elements are working together to achieve business and strategic goals. It also identifies which of these critical elements are working against you. Our approach is unique in that we measure the inter-relationships of the essential elements that become the predictors of future strength. 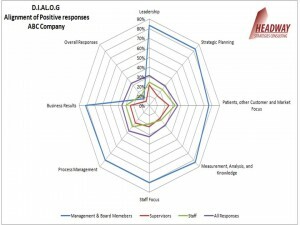 It also provides a comprehensive perspective of the business based on the criteria for Performance Excellence as used by the Malcolm Baldrige National Quality Program. Today more than ever before, organizations are seeking better ways to accurately assess an individual’s strengths for development to help ensure the retention of top people. It’s also critical to ensure for the organization to have the right people in the right positions doing the right things for the right reasons. Individuals in transition will also find this information extremely helpful as they look toward the next opportunity. A personal assessment tool that provides information as to how a person thinks and makes decisions—what natural talents he or she possesses. By understanding the way in which a person thinks, it becomes possible for the individual to leverage that knowledge to make better decisions, maximize strengths, minimize weaknesses, and achieve greater results personally and organizationally. DISC measures a person’s natural and adaptive behavioral styles, which is crucial when working with team members, as a leader or manager, or in an environment that requires conflict resolution. By understanding how you prefer to behave, you are able to better align your environment, and select the work that ensures more meaning and success while producing less stress. Values Index delivers the most comprehensive understanding of a person’s value or motivational structure. Understanding what really motivates or drives a person is a crucial part of success. It is this understanding that helps to ensure that optimal motivation, passion, and drive are always created to achieve the highest levels of personal and professional success. Contact us to find out how we can work side-by-side with your business to clearly understand your objectives and capabilities to define a clear and pragmatic strategy.